With temperatures in Ontario reaching record-breaking lows, it’s more than the ground freezing over. In an awe-inspiring visual, Niagara Falls has completely frozen over – or so it would appear. Surprisingly enough, the exhilarating roar of the falls as we know it in warmer months hasn’t frozen and likely never will—with icy waters rushing beneath the frozen surface on below freezing winter days. Above the surface, miniature glaciers and twinkling icicles prove wicked winter weather can create something truly extraordinary. 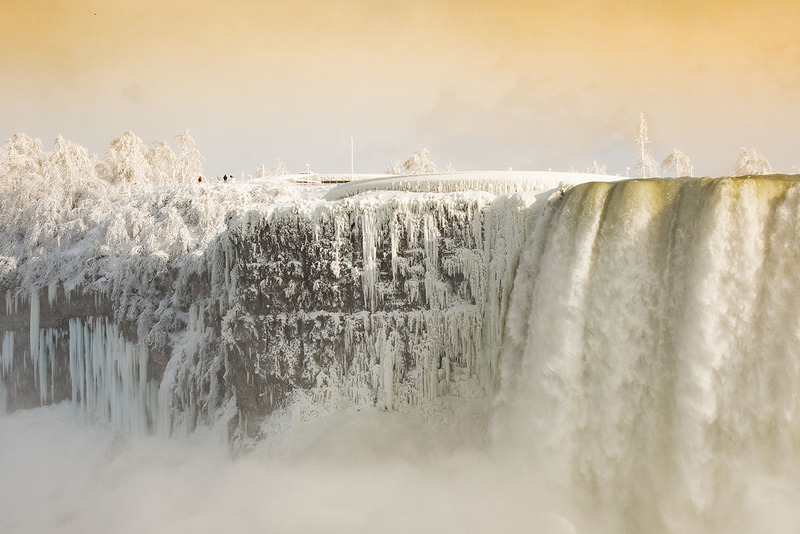 “Many visitors here know the beauty of the Falls in the warmer months, but anyone who has braved a cold winter day to see them in their rare, frozen state, will tell you it truly is a multisensory, awe-inspiring experience unlike any other,” said Anthony Annunziata, President, Tourism Niagara Canada. How does the Canadian Horseshoe Falls differ from the American Falls? Have you noticed the icier appearance of the American Falls? This is due to a difference in the amount of water flowing during the winter months. While the Horseshoe Falls receives around 93 per cent of the Niagara River flow, only 7 per cent goes toward the American Falls. Less water means greater opportunity for ice to build up, similar to shallow ponds freezing more than vast lakes, giving the illusion of a “Frozen Falls”, which is best viewed and photographed from the Niagara Parkway located in Canada. What causes the frozen falls Ice Bridge? The phenomenon known as the “ice bridge” forms in winter when temperatures are remain consistently below zero degrees Celsius. January often sees a mild spell followed by a strong southwest wind, breaking up the ice and travelling down the Niagara River and over the Falls. The wet ice is forced up out of the water below the Falls, freezing into a huge mass and taking the appearance of a glacier. This ice build-up has the potential to reach a height of ten stories and is a sight to behold! Has Niagara Falls ever stopped due to being frozen? It’s hard to imagine anything could stop the gigantic rush of water over the Falls but records show it happened once. For 30 long, silent hours in March 1848, the river ceased its flow. High winds set the ice fields of Lake Erie in motion and millions of tonnes of ice became lodged at the source of the river, blocking the channel completely. Locals, who were used to the sound of the river, heard an eerie silence and those who were brave enough walked or rode horses over the exposed basin. The self-made dam held the water back until a shift allowed the pent-up weight of water to break through. The annual installation of the ice boom has prevented this from happening since that time. A spectacle that only comes along once every few years, visiting Frozen Niagara Falls offers a chance to reconnect with the outdoors, providing a rare glimpse of nature that few have the opportunity to experience.